For many of us, once the Holiday Season is behind us, we dread the cold days ahead. Sunny days in May feel like an eternity away! I remember longing for warm, sunny days as a kid. There were only so many snowmen and forts that I wanted to build. I longed for jumps in the lake, barbecues and after school bike rides to the park with my besties! When you were a kid – you remember what it was like. A day felt like a week, a week like a month and a month often felt like a year. Time could not go by fast enough. In those years I had to work hard to not feel sad and bored during the winter. My Mom and Dad taught me to make the best of it, so that’s what I did. Today, on this chilly weekend I thought it would be fun to share with you my top ten winter blues remedies that started at the age of 5 or 6 and are still a work in progress right up until today. I’ll leave it to you to guess which remedies the 5 year old me came up with vs, the teenager, vs the adult (Hint, I never actually grew up, that’s just a trick anyway). 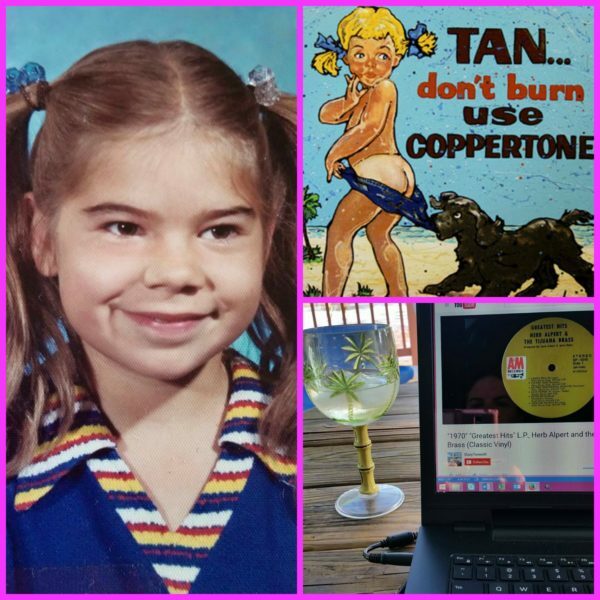 Slather yourself in Coppertone Sun Tan Lotion and fall asleep with the light on, pretend you are on the beach and that’s just sunlight on your face. Buy the complete Box Set of the Love Boat. Watch one episode every Friday night at 9pm, as though it’s still 1978. Attend a hot yoga class, come home and make yourself a virgin Pina Colada! Lots of fresh pineapple please!! Pineapple strengthens the immune system and is LOADED with Vitamin C! It’s -15 degrees BUT the sun is shining!! Outside you go, my friend! Drink in that Vitamin D! You will feel sooo good! Look at yourself in the mirror and love those rosy cheeks! You are absolutely adorable! Barbecue a steak! That’s right, you heard me! One of my best memories is my Dad shoveling a path to get to the barbecue so that we could have a steak on his birthday! Beer in his hand and a smile from ear to ear. He had the right idea! That’s what I call creating your own happiness and sharing it with your family and friends! Ditch the bra and wear a bikini top under your sweater! Go get a pedicure! Choose the hottest pink they have! Go neon! Wear COLOUR!!!! When everyone else is holding back because, oh, I have to wait until spring to wear chartreuse or coral is more for summer, you REBEL! Get your brightest, happiest colours on and feel as fabulous as you look! I wish you a happy and playful winter with no restrictions. Keep living your dream and adventuring! Don’t wait for warm weather to make it happen. Time goes by fast now, winter really doesn’t feel like an eternity like it used to, so I say let’s make the best of it and enjoy ourselves. Can’t wait to bump into you in the grocery store in your sunshine yellow winter coat scoping out the fresh pineapple! I believe you just perfected time travel! Just reading this brings me back to my childhood in the 70s with Julie and Captain Stubing and the lazy feeling of falling asleep on my bath towel on the soft and sandy beaches of Port Dover or the dock in Muskoka. Sigh. I feel rejuvenated just thinking about it! Thanks for the trip back in time! Ooooh Jacqueline! I sparked it! That makes me soooo happy! Happy to be your cruise director on the time travel machine anytime! Aaaah . . . the memories . . . Key Largo (Bogie and Bacall) . . . Grassy Key (“our” balcony) . . . Key West (cute puppies in the pet shop window) . . .
Are you ready for the One of A Kind Spring Show?